Located on the shores of West Lake Okoboji, Sunrise Cove at Village West offers excellent summertime activities in the heart of Iowa. Guests enjoy docking their boat on the lake, fishing from shore, and canoeing through the placid waters. The beach around the lake is also great for swimming and hanging out to enjoy the great outdoors. Wintertime activities include snowmobiling and ice fishing. 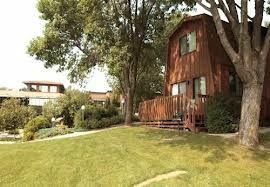 The Lake Okoboji timeshare resales at Sunrise Cove at Village West offer studio to four bedroom units accommodating from two up to twelve people. Timeshares are fully furnished with up to three full bathrooms in the larger units. Guests will also enjoy full kitchens with stove, refrigerator, microwave and dishwasher. The living room features a television and the bedrooms also include cable TV and DVD. Some rooms include washer and dryer and fireplace for cozy evenings with family and friends. These units provide all of the comforts of a true vacation home. On-site amenities at Sunrise Cove at Village West include an arcade and game room, pool table, fitness room and indoor swimming pool. Guests can rent movies at the front desk and ask about area attractions. The restaurant offers a variety of family-friend food options and is open during the summer with weekend hours during the winter months. Families can also rent canoes to explore the lake or spend time at the mini-golf course perfecting your putting. When touring the nearby area, guests will enjoy an amusement park, paddle boarding, antique shops and kayaking. Nearby golf courses offer entertainment for the golfers in the family. A fun nighttime activity includes spending time at the Superior 71 Drive-In, taking in a movie and spending time with the kids. Vacationing in the Mid-west has never been more fun and entertaining. Lake Okoboji timeshare resales provide units that accommodate large families and friends with comfort and convenience. Winter time sports enjoyed at Sunrise Cove include snowmobiling, cross-country skiing, ice-skating and ice fishing. Hiking or biking along the outdoor trails offers views of wildlife and beautiful fall foliage. Contact Sunrise Cove at Village West Specialist Today! This resort is nestled on a private beach which also has a boathouse with food, beverages, lift rental, speed boat, pontoon and jet ski rentals, plus it has a boat gas station. The karaoke bar, on site restaurant, movie theatre plus both in and outdoor pools make this a great place to stay year round! My husband and I stayed at Sunrise Cove at Village West for one week for our anniversary! It was amazing, beautiful, relaxing and fun! A myriad of things to do or simply relax, read, walk and enjoy each other. It was very romantic. But next time we will bring our grandchildren as there are so many activities for them to enjoy. Every water sport you can imagine, an amazing amusement park, theaters, dining, parks and bike trails. They also had fun marinas with live music constantly and fabulous dining! I so recommend Sunrise Cove at Village West!